The Canadian market has become an appealing market to US based retailers for expansion, but not without considerable challenges. Initially, there are many things that Canada has in favor: Its market is close in proximity, Canadian consumers are fairly familiar with US based retailers and English is widely spoken. However, the Canadian market is not entirely homogenous to the US market. As large retailers have experienced in the past, it takes quite a bit of time and investment in order to get it right in Canada. Retailers in Québec are mandated to communicate with customers in French and this is enforced by the Charter of the French language (OQLF) – (read about our services for the Francization process). There are specific rules that protect the French consumer from having to obtain information on commercial goods and services in a language other than French. 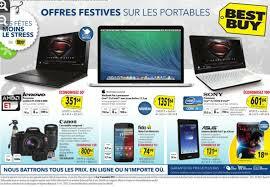 Where most retailers may take a phased approach to introducing Spanish language in the US based on market research, it is required by law to ensure that all in-store advertising has to be in French and markedly predominant over any other language. Our experience in French translations in retail marketing spans for over a decade, with translation experience in eCommerce, Retail Management Software, In-store marketing and Advertising (direct mail and online). In this post, we will discuss the importance of terminology management and brand consistency as retailers take on the Canadian market. 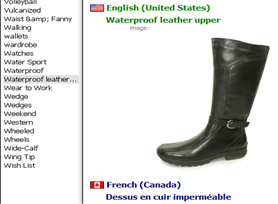 You can read more about the typographical differences of French translation for Canada here. From print advertising to eCommerce, it is important to manage terminology for consistency. With so many brand messages and terminology, it is important to provide a consistent message to the consumer in your marketing translations that is accurate and understandable to the local market. Furthermore, as described in our Francisation process, there is certain terminology that is standard in Québec that should be followed and it is highly recommended to run terminology decisions through a professional linguist that subscribes to and follows the changes of terminology that is published by the Canadian government and/or by the OQLF. Brand consistency can be a challenge. There can be many players who may all have their own reference on terminology, including Canada store managers, district managers and marketing managers. Therefore, if you are a U.S. based company and translating your materials, your translator’s choice of terminology may differ from that which is used internally by the employees of the store. It’s important to take control over the most important brand terms and catalog these in a glossary of terms and standardize them throughout the organization. For instance, think of the name of a customer loyalty program or reward program. The name of this type of program will appear in many different places, including in-store marketing, POS, email marketing and online, usually managed by different people and departments. Without a centralized effort towards terminology management and a clear direction, the roll-out of such a program in Canada can take on delays or end up being inconsistent, resulting in confusion and potential dissatisfaction with the consumer. Immigration policies in Canada make it hard for US based retailers to relocate company talent over to Canada. This means that there is a strong need for local French language expertise who can communicate brand message correctly and provide effective employee communications in French. When we helped one of our retail clients to enter the Canadian market, all HR employee communication had to be rolled out. A centralized effort in terminology management was key to employee engagement and effective roll-out of HR policies. We collected a few hundred terms ahead of time that needed to be agreed upon before we could start translation. Disagreement on terminology after the translation process has started can be costly, as these terms usually appear in many different places and would require manual processes to change them throughout. Many terms that we find are company specific and need to be explained. There may be concepts that need to be adjusted to industry-wide terms that are already used in the retail world. As US based companies need to hire from within the retail industry in Canada, their policies and concepts need to either be made relevant or training materials need to effectively explain the store’s management concept. One challenge is the use of software technology that has already been localized. Our client in the previous example had a Point of Sale (POS) Manual that needed translation. Their software was already partially localized and we had to make sure that these terms did not conflict with terms already approved. Through this review, we identified areas where the POS software will have to be updated in order for it to be relevant to the store’s management policies. Without a conscious effort to manage the terminology in all aspects, there is a high risk for inconsistencies and ineffective policies as well as the employee who may not understand how to operate efficiently in the software because of the inconsistencies between what is in the manual translation and what is on the screen. We use Translation Memory software to capture this terminology and automatically apply it to any piece that we translate. Building a catalog of approved brand terms provides a clear direction on French terminology that will be used in-store, online, in direct mail and by employees as well in inventory systems and POS systems. Our Project Management is dedicated to manage and organize people and processes in order to roll out translation in a coordinated way. It’s often underestimated, but having a dedicated project manager adds tremendous value as it often is the single point of contact where information flows through. Finally, we only work with dedicated teams of translators with specific industry expertise. Too often, we talk with clients whose vendor handed off translations to any translator who is available for the job. Our dedicated teams not only make use of the technology that is available for consistency, but also know about the decisions that have been made in the past and have become familiar with the client. This makes for a smooth translation process and collaboration with our clients. 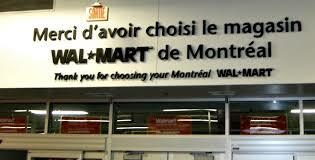 We specialize in marketing translation in retail marketing for the Canadian market. If you are a business in the U.S., that is thinking of expanding your operations here, give us a call to see how we can help you succeed in this market.